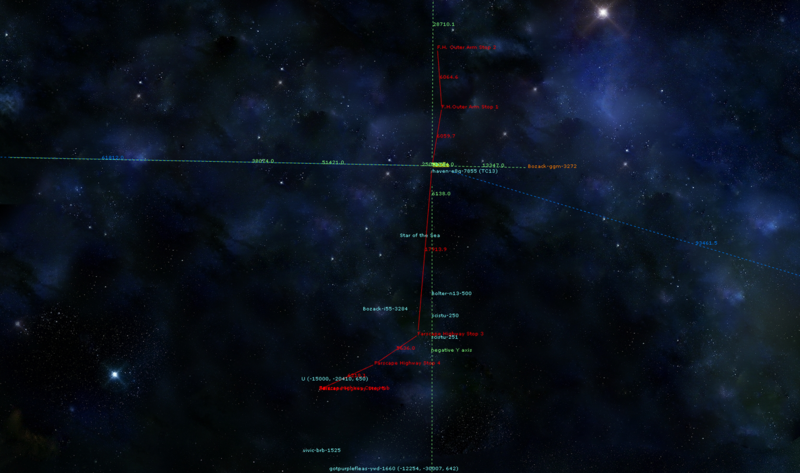 Z axis on the map is depth of the galaxy or height. The X and Y axis will traverse you through the galaxy being either positive or negative. Based on this information i did the following better find the core, which will give us a far better chance to find earth. To make Ascent's massive scale more manageable by placing a chain of colonies towards the center and eventually earth once the core has been found. The highway has 8 colonies or Stops in it's entirety so far. There are 2 stops North (+Y) of Apollo and 5 stops and a Hub South (-Y)of Apollo with stop 5 being connected to the Hub via gate (under construction). All the stops have a colony Fuel station and Osb for repair and fueling.All jump distances are set below my mark distance or 137000 hydrogen, which is currently best traversed with a leviathan.The current state of the highway features mostly fuel and repair as intended. However a few stops have food for sale. Specifics are as follows. Notes: This was my first stop ever constructed it comes complete with a Leviathan npc due to a bad emergency jump. Current hydrogen storage: 1 mil. Notes: This is a very nice system, good geo planets and good food. Spectral class: Class A main sequence. daily hydrogen supply: 2 mil. Notes: Has some meat for sale, pick up some jerky for the road! Asteroid field: Kamacite, Urilite, Angrite. Notes: Needs more stoarge. Pick up some veggies! Notes: This stop is my weak link in hydrogen supply's and a thorn in my side, needs fixing more then just playing with dome controls. Notes: Gate conection to farscape core hub has been started, farscape hub will be supplied first. Notes: This is a colony and planned shipyard nothing more at the moment. Work in progress! So far so good even with progress taking time i do feel that my stop 5 and 6 are both within the area of the core. I can feel it in my bones. I have decided to put a gate from my highway to a hub roughly at the halfway point. Stop 5 and the Hub are connected but undergoing a supply stage. This is done with a effort to not have to go back to Apollo ever really, only when i need colonists. Also a cool place to hang out while i find the core. Which is something i have been trying on regular for a couple of months now, still no dice. However there is a obscene amount of ground to be covered. I have resorted to calling it the assent lottery"roll them dice see what happens". I would very much like to get the location of the core before continuing through stop 11(proposed earth) as my approach to earth would be far more precise then saying maybe that way?..!!?. Anyways it is a huge post and i'm babbling all in all i would say the highway is 40% complete towards earths current guessed location. There will be a upcoming huge delay while i find the core to better precisely identify earths location. I have spent over 40 billion on highway too date! Much of the highway supplies have been brought to you by Loki and Fragmented osb in Mz3 i think Fraggii, thanks guys! To jump from Apollo to stop 6 is 31287.2 ly would cost you 703,962 hydrogen to jump that distance! If jam put in player osb repair today i can move 10 people a day to the core area! Last edited by Vivic on Wed Jul 25, 2018 3:31 am, edited 8 times in total. Congrats, thats a Huge Effort ! .... and a Ship Load of Hard Work ! Here are a couple pics of The Farscape Highway. The first is a full view, but stop 5 and the Core Hub are overlapping so the second is zoomed in on them. Fantastic achievement fleas/Vivic. I really hope that YOU guys are the one to find earth. I will post updates in Yellow with dates, when i can .Build it and they will come! I have been setting up colonies and bases on some of the farscape highway stops. 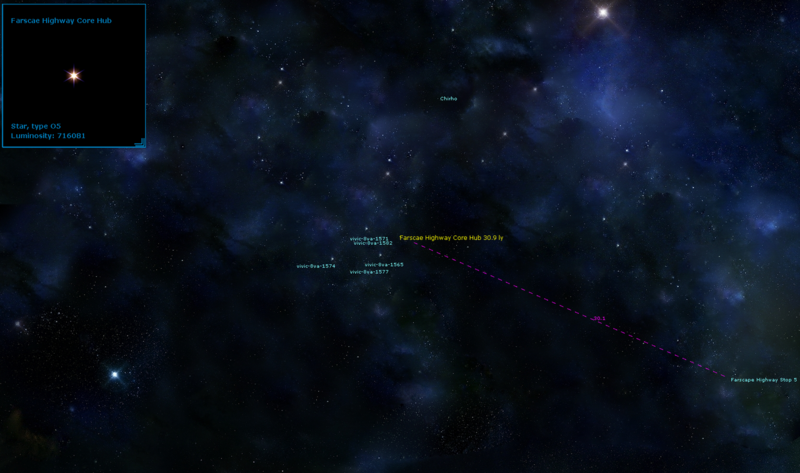 Near Farscape highway stop 4 there is a system with a gas giant .58 earth gravity. In a North/South orientation you will pick up Hydrogen, then Nitrogen and lastly oxygen. If you change to the East/West orientation you will harvest hydrogen. The gas giant is in Rhaven-8m3-8158. Cheers! My plan is to set up star-bases with supplies to allow others to set up small repair stations so they may continue on exploring. My current travel route is TC9-Midway-Kore-Farscape Highway Stop 2-Farscape Highway Stop 3-Farscape Highway Stop 4-Farscape Highway Core Hub. Rhavenwing! Love that you are using my highway to your advantage. Any of my resources on any of the highway stops is there for you or anyone to utilize. Should you have any suggestions on improvements or fixes let me know and i will try and accommodate. The gate just needs iron and carbon from Core hub to stop 5. I have travelled in the wrong direction for about 6000 light years before making this discovery....alas more clicking is in my future. Here is a Kore area map...notice it's gated to Peace.